Natures Life Organic Alfalfa 500mg is a perennial botanical that is rich in minerals and nutrients, including calcium, magnesium, potassium and carotene. 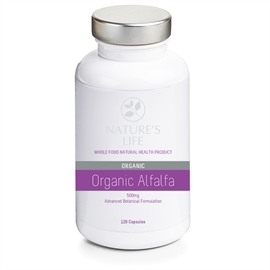 Alfalfa is also rich in protein, vitamins E and K.
Natures Life Organic Alfalfa is extremely nutritious. It has a deep, extensive root system which enables the plant to absorb high amounts of nutrients from the soil. For this reason, Alfalfa contains essential vitamins including all B-vitamins as well as A, D, E and K. It’s a great source of iron, folic acid, niacin, biotin, calcium, magnesium, potassium, and phosphorous. Alfalfa is also a great source of chlorophyll (which helps detoxify the liver and aid digestion) and is high in both protein and amino acids. Containing so many nutrients is easy to see why Alfalfa is considered one of the healthiest plant foods on earth, providing an excellent range of nutritious properties for optimal health and wellbeing. And as Natures Life Organic Alfalfa is certified organic, it ‘guarantees’ the purity of every nutrient derived from the plant – no exposure to pesticides or herbicides – it’s 100% pure. The sheer amount of all vitamins and minerals in this ‘one’ single plant makes the health benefits evident. Vitamins possess antioxidant properties which helps prevent cell damage caused by oxidative stress, and even helps repair any damage to cells that previously occurred. Antioxidants provide an effective way to help support health and wellbeing from within. Chlorophyll helps to detoxify the body as it connects with toxins and free radicals that are already present in the body, and neutralises them. It has been shown to help eliminate heavy metals that have accumulated in the body, pesticides and industrial pollutants, effectively helping to detoxify the body. Chlorophyll also possesses anti-inflammatory properties, as it makes the body more alkaline so that it can influence the acidity of bodily fluids, such as urine or blood, and therefore may be used to prevent diseases and inflammation in the cells. When it comes to Arthritis, sufferers have reported relief from the constant pain when taking alfalfa supplements. It is believed the pain is reduced as the alfalfa neutralises the uric acid in their body. Alongside this benefit, the trace minerals in alfalfa also help the body repair and rebuild joint tissue. With regular use, Alfalfa has been shown to help promote digestion and reduce most stomach upsets. It contains a great ‘8’ digestive enzymes, so is able to help reduce gas pains, nausea, indigestion as well as appetite. Alfalfa also contains fibre which has been shown to slow the release of calories from food consumed, thus helping reduce blood sugar levels. A few minerals in alfalfa also have a direct impact upon blood sugar levels including Potassium which the body needs in order to convert blood sugar into glycogen and Chromium is essential for controlling insulin levels. Is Natures Life Organic Alfalfa 500mg Right For Me? Alfalfa is renowned as the ‘Father of all Foods’ due to its superiorly high nutrient content. This one plant, and its vast root system, is able to provide vitamins, minerals, protein, amino acids and chlorophyll. Natures Life Organic Alfalfa may be the only supplement you need to take daily to help promote and support your health & daily wellbeing, as its benefits are many. For more than 1,500 years, alfalfa has been used in herbal medicine and its uses of promoting health are well documented. Considering alfalfa has been recognised for so long, helps demonstrate its efficacy. If you choose to take our certified organic alfalfa, it may well prove to be the best ‘natural’ benefit to your health. Published in Atherosclerosis, 1987, Mölgaard J et al conducted a study titled ‘Alfalfa seeds lower low density lipoprotein cholesterol and apolipoprotein B concentrations in patients with type II hyperlipoproteinemia’. Here, 15 patients with hyperlipoproteinemia (HLP - an inability to break down lipids or fats in the body, specifically cholesterol and triglyceride), were given 40g of heat prepared alfalfa seeds 3 times daily at mealtimes for 8 weeks with otherwise unchanged diet. In patients with type II HLP alfalfa treatment caused after 8 weeks a maximal lowering of pre-treatment total plasma cholesterol and low density lipoprotein (LDL) cholesterol, 17% and 18% decrease, respectively. Maximal decrease was 26% in total cholesterol and 30% in LDL cholesterol. Once the study was complete, all lipoprotein concentrations returned to pre-treatment levels. Researchers concluded that alfalfa seeds can be added to the diet to help normalise serum cholesterol concentrations in patients with type II HLP. There are many forms of HLP, and type II is the most common, therefore, results show that for most sufferers of HLP, Alfalfa supplements would be beneficial to help lower LDL cholesterol levels. What Makes Natures Life® Organic Alfalfa Better than Other Alfalfa Supplements? Recommended by our health experts Natures Life Organic Alfalfa 500mg has been developed by clinical healthcare experts. The ingredients have been carefully formulated with research to ensure they deliver results. Natures Life Organic Alfalfa 500mg is also recommended by nutritionists. Nature’s Life is a brand that encompasses every key nutrient we could possibly need in order for our bodies to function optimally, which are all derived from nature herself. Pure, untouched by pesticides or herbicides, grown freely in nature’s own soil, containing no fillers, preservatives or colourings, each capsule is packed full of nature’s own potent produce to ensure your body only receives what nature intended. Clean, pure, natural ingredients packed full of health benefits, each product is a potent blend derived straight from nature. At Natures Life we provide high quality, well-researched nutritional products and we are committed to providing our customers with the best, natural & most effective supplements for optimum health, whilst supplying these to the highest standards possible. We aim to make a substantial contribution to the health & wellbeing of all those who use our supplements. Every one of our products are produced in the UK, to Good Manufacturing Practice (GMP) standards, where we can ensure complete traceability and quality. Supplements are manufactured in small batches so we can ensure each and every product is perfect. As a food supplement, take 2 to 6 capsules daily with a main meal, or as a directed by a professional. Suitable for vegetarians.